The singer, who was raised in Oakland and currently lives in Los Angeles, makes a winning sweet-and-sour blend of contemporary R&B. She can strike a confident yet self-aware pose. On her single “CRZY,” she boasts, “If I gotta be a b—— I’ma be a bad one,” then adds, “I kill ’em, I kill ’em, I kill ’em with compassion.” Her music hearkens to the honeyed melodies typical of ’90s stars like SWV and TLC, homage-paying references to past hits like New Edition’s “If It Isn’t Love” and Akon’s “Don’t Matter,” and the ecstatic flights of melisma that suggest unfettered joy. Kehlani is a capable and surprisingly strong singer, too, though she often sticks to a strident middle range. When she professes her love, she tends to look for a roundabout way to do it. When she asks, “Do you want to be a distraction, baby?” on “Distraction,” her seduction doesn’t necessarily roll off the tongue. But it’s appealing all the same. Yet months after the January release of her retail debut SweetSexySavage, Kehlani has evolved into a critic’s darling who can’t quite breach pop radio. Sean “Puffy” Combs has said that Kehlani “saved R&B.” When Solange accepted the Centric Award at the 2017 BET Music Awards, she shouted out the new wave of women in R&B. “I love Syd, and Kehlani, and SZA, and Kelela and all the new-school girls who are out here,” she said. However, none of Kehlani’s singles have cracked the Billboard top 40 so far. “Gangsta,” a trap-inflected number where she channels Harley Quinn from last year’s Suicide Squad, came closest, earning a RIAA platinum certification yet paradoxically stalling at No. 41. The moderate success of SweetSexySavage has reignited conversations about whether the music industry is devaluing R&B artists and, specifically, talented women of color. Kehlani’s not alone: Sevyn Streeter, SZA and Mary J. Blige have also released superior major-label projects this year, only to find a muted reception on the pop charts. The irony is that, as a genre, R&B has never been healthier. It teems with variety, whether it’s the neon-hazed, synthesized romance of H.E.R., the sun-dappled hip-hop funk of Anderson .Paak, the gauzy teenage fantasies of Khalid, or the airy, baroque star-gazing of Chloe x Halle. No longer limited to the binary debate between “jiggy” urban pop and earthy neo-soul that dominated at the dawn of the millennium, today’s R&B world is as diverse as any other. 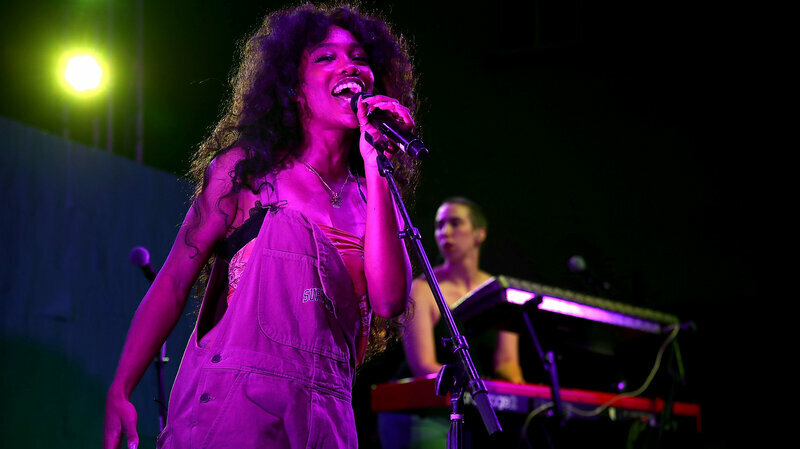 The successful June release of SZA’s Ctrl came after long label delays and her own creative anxiety. There are a few men who take a hyper-personal approach to songwriting, namely the incandescent Frank Ocean, who writes in rich, complex metaphors. But it seems like most aspire to the aesthetic masculinity of rappers. They talk-sing boasts in a wavy voice that threads the needle between melodic pop-rap and clubby, hard-edged trap music. It’s no surprise that listeners occasionally refer to the likes of Chris Brown, Bryson Tiller, and the Weeknd as rap stars — sometimes they dispense with singing altogether and spit actual bars, if only to underline their unbeatable virility. But generally speaking, men dominate rap music — at least its most visible variant. So R&B women have subtly developed values and thematic ideas that contrast with corporate rap’s muscular displays of material wealth, opiate consumption, casual violence, and the necessary ability to steal your girl for a one-night escapade. It’s a compelling package that has yet to receive the industry support it deserves. Tinashe’s controversial comments on colorism in The Guardian overshadowed her critique of an industry where space for black women’s success feels limited at best. Tinashe has also tried to split the difference between artistic and commercial dictates, with uneven success. Her early, electronic-fused mixtapes had a wonderfully hermetic feel, as if she were singing quietly into a microphone on her laptop. On her 2014 major label debut Aquarius, she leavened her dense, whispery meditations, like “Cold Sweat,” with swaggy and accessible confections, like “2 On,” a delirious celebration of over-drinking that climbed the upper reaches of the Billboard top 40. But despite critical acclaim — Jon Caramanica of the New York Times called Aquarius “one of the most inventive R&B albums of recent years” — she hasn’t been able to score anything on the scale of “2 On.” Meanwhile, her long-delayed follow-up Joyride remains unreleased, leading her fans to protest with the hashtag #FreeTinashe.